Potatoes are not the only mash in town anymore. 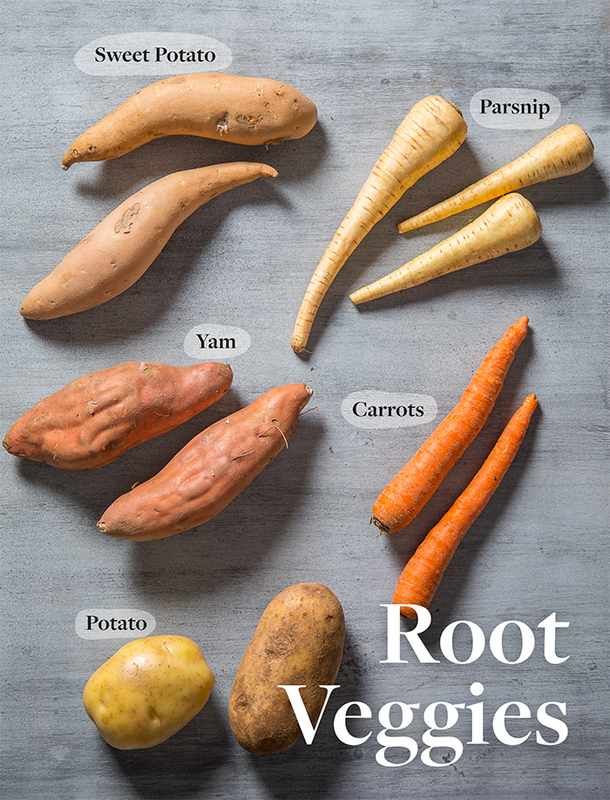 Mix up the usual mash this holiday with it’s more nutritious and far more flavorful cousin Root Veggie Mash or lighten up traditional mashed potatoes by cutting using half cauliflower and half potato. Follow my step-by-step guide for the creamiest (non-dairy) mash. Follow the guide below to see the options for each mash component and pick your favorites! Make your own using these ratios, and see below for some of my favorite flavor combinations. Every good mash is served with a few toppings. For inspiration, see our Mashed Potato Bar recipes. Peel vegetables, if desired. I usually keep the skin on at least half my vegetables for mash but you will get a creamier mash if you remove all the skins. Cut vegetables into one inch pieces. Add vegetables into a large pot and run cold water over them to wash away extra starch. Do this a few times until water is clear. Cover vegetables with cold water (which helps them cook more evenly). Season water thoroughly with salt—it should taste like the sea. Bring pot to a boil and cook vegetables until they are fork tender. Drain root vegetables and let sit a few minutes until they are dry from excess liquid. While root vegetables are cooking, prepare the liquid and fat. You only ever want to add hot liquid and fat to mash to avoid the starch from tensing and not mixing with the liquid or fat. Heat your liquid and fat over medium heat. This is your opportunity to infuse the liquid with any mix-in flavorings. Add in any mix-ins and allow the mixture to simmer for 5 to 10 minutes. Add root vegetables back to pot and use a potato masher or the back of a wooden spoon to mash the vegetables. Alternatively, you can run them through a ricer, food mill or a larger mixer with a whisk on low speed. Never, ever, use a blender or food processor—the blades create too much starch and you will end up with root vegetable glue instead of mash. Slowly, mix the hot liquid into your mash and season thoroughly. Watery vegetables like cauliflower need a little less liquid. If you need more liquid than you have for starchier root veggies, quickly heat up extra to be mixed in. Serve mash immediately for the best texture and taste. If you wish you make your mash ahead of time, there are two options. Make mash according to my direction above then add the mash to a greased casserole dish. Top with breadcrumbs. Keep in fridge for up to 2 days. To serve casserole, heat it in a 400°F oven until crispy and hot throughout. Make mash according to directions above to Step 3 and Step 5, omitting 4, 6, and 7. When ready to ready to serve, follow step 4, 6, and 7. The hot liquid will bring the mash to life again. What is your favorite way to make the best mashed potatoes?